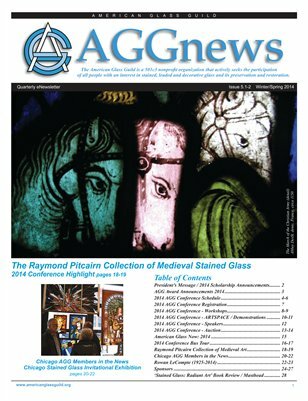 A preview of the 2014 American Glass Guild conference, being held June 26-30, 2014, In Bryn Athyn PA. Announcemnet of the 2014 Whitney Scholarship recipients, and AGG Award recipients. Details on workshops, demonstrations, talks and the annual AGG Auction, benefitting the Whitmey Scholarship fund. We look at a group of Chicago stained glass artista nd their first Stained Glass Invitational Exhibit. Finalyy, we remember Rowan LeCopte (1925-2014), a stained glass artist who designed windows for the Washington National Cathedral.